Buying a home in San Diego will set you back. This is not exactly breaking news. But it’s useful to quantify exactly how expensive San Diego housing is, and how this has changed over the years. A good way to measure housing expensiveness is to compare home prices with the two main factors that typically drive them: local rents and incomes. • Incomes tell us how much San Diegans earn, which correlates to how much they are able to spend on housing. Between them, these two numbers capture most of the important elements that influence home prices, including population, housing supply and economic conditions. They can, therefore, give us a ballpark idea of how much it should cost to buy a San Diego home. 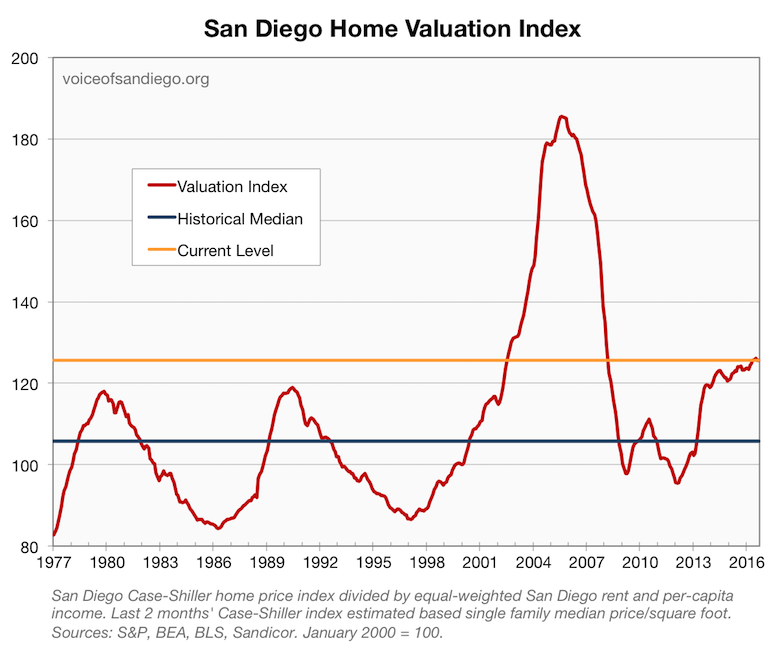 This graph reveals a critically important pattern: While San Diego housing valuations have had some pretty wild ups and downs, they’ve tended strongly to be drawn back toward a historically typical, middle-of-the-road level. This makes sense — home prices should have a tight relationship with how much people earn and how much they are paying for rent. If prices get too far out of whack from rents and incomes, it’s a good indicator that something else is afoot. The mid-2000s housing bubble clearly visible on the graph provides a dramatic example. Back in the bubble days, a lot of platitudes were making the rounds as housing bulls tried to rationalize soaring real estate prices. But a quick look at the valuation ratio revealed them to be off base. “Everyone wants to live here” and “they’re not making any more land,” in addition to being longstanding features of life in San Diego, didn’t explain why home prices should leave rents — also subject to the laws of supply and demand — in the dust. High-fiving about the booming economy didn’t justify the fact that home prices were rising in vast excess to local incomes. Valuations were also a useful guide in the ensuing crash. After a brutal multiyear home price decline, it seemed pretty common to believe that there was no end in sight. But eventually, the valuation ratio showed that San Diego home prices — while still high compared with most other cities, and maybe to what some people would like them to be — were back to pretty typical levels compared with rents and incomes (and, for a while, even below them). Since hitting bottom in early 2012, valuations have been on the rise again. While nowhere near peak-bubble levels, homes are now more expensive than they’ve ever been outside the bubble years. There is an interesting wrinkle this time around: Despite unusually high purchase prices, all-time low mortgage rates are keeping monthly costs quite reasonable for borrowers. Compared to rents and incomes, the monthly payment on the median San Diego home is actually lower than the historic norm. These super-low rates are surely helping keep home valuations aloft, but we should be careful not to put too much weight on the monthly payment factor. Several other elements come into play when buyers decide how much to pay for housing, including anticipated changes in prices and interest rates, expectations for future rent growth and non-mortgage costs such as down payments and property taxes. All these factors together have resulted in a strong tendency for valuations to gravitate back toward that middle-of-the-road level. The fact that this tendency has endured across the 40 years shown in the chart, even though interest rates have varied enormously over that time, is pretty compelling. But “compelling” is not the same as “a sure thing.” It’s possible that low rates (should they persist) or housing supply constraints could support higher-than-typical expensiveness indefinitely. Only time will tell whether valuations remain aloft or return, as they have in the past, toward more historically normal levels. In the meantime, potential buyers and sellers should bear in mind that San Diego homes — while nowhere near the nutty heights reached during the bubble — are more expensive than they’ve been through most of the past four decades. Rich Toscano has been observing the housing market for Voice of San Diego, with the occasional prolonged absence, since 2006. Follow him on Twitter at @richtoscano or read more about San Diego housing at his blog, Piggington’s Econo-Almanac.